My Bigsby mod, just as good or better than a floyd rose. I was allways unhappy with the ammount i had to move the arm on my bigsby to get the desired tremolo action even though i love bigsbys, after an hour of tinkering and thinking i figured out how it all works and came up with an incredibly simple fix anyone can do. as you can see all i have added is annother washer but after thinking for a while i saw that what i needed was a washer that fit over the second larger shaft so that it would add to the compression of the spring, if you tighten the lock nut all the way down withoout the new washer the spring can still be compressed a bit and when all put together this extra compression space means you have to move the tremolo arm more to get an effect than if the arm was fixed in one place, this mod allows you to compress the spring fully but still be able to swing the arm back. the washer was about 0.5mm thick you may need to use a thicker washer or a multiple of this washers. make sure the second washer goes over the larger shaft and is centered when you tighen the lock nut otherwise it will catch on the side and punch between the nut and where the small and large shafts meet. 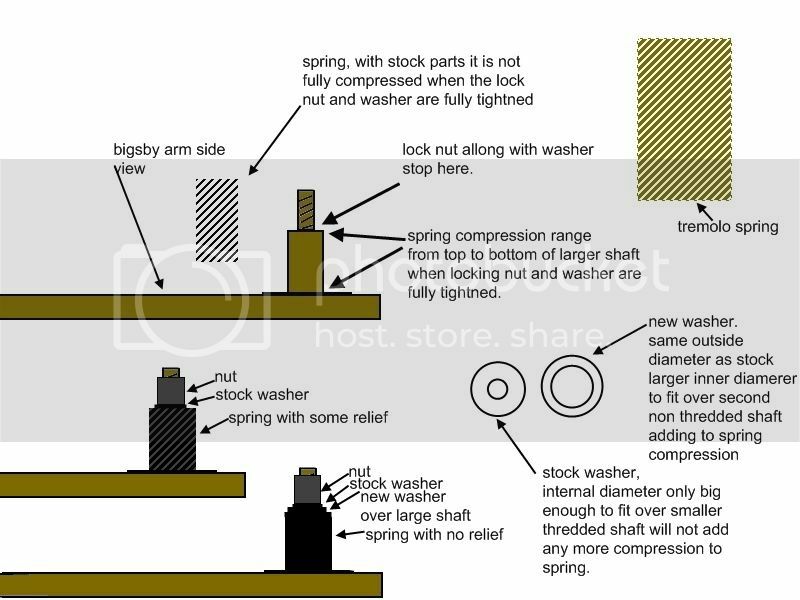 it is also a verry dood idea to file the ends of the compression spring like the ends of the tremolo spring so they cannot bite the washer or the inside of the arm, doign this will allow for a muthc smoother action when you swing the arm back. with this mod my bigsby works as though it has a fixed arm itc compleatly stable and works muthc more fluidly. i am able to get a perfect tremolo action with the least ammount of movement so now i'm not punching the pickguard whenever i use the bigsby. hope this helps anyone with a bigsby. Im gonna try that thanks! if you run into any snags send me a pm. Have you ever heard of putting a penny under the spring? If I understand your drawing and explanation (which is very smart, btw), then I think the penny does about the same thing. I think. People have been using the penny trick for 50 years, so I didn't know if you've ever heard of it, or if your trick is actually different (which it might be). it is for one we don't have pennies over here and two this little mod is actually adjsuting the small assembly of the nut spring and washers that hold the arm of the bigsby to the rest of the contraption not the spring that flexes when you use the bigsby. my mod tightnes the spring that holds the bigsby arm (witch with stock parts and fully tightned still has allot of give) firmly in place while useing it and still allowing it to be swung back.